4/26 Cup of Coffee: With rain washing out both the Pawtucket and Portland games on Tuesday, it was the seventh day in a row there was not a full slate of games in the Red Sox system. Salem got right back to its winning ways with Austin Rei and Josh Ockimey leading a big inning. Greenville pounded out 13 hits, but Logan Boyd (pictured) was the most impressive Drive player with an excellent outing on the mound. Pawtucket Red Sox vs. Indianapolis Indians (PIT), PPD. The PawSox will make up Tuesday's rainout against Indianapolis on Thursday. 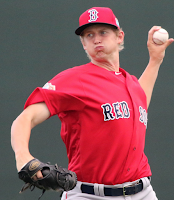 Brian Johnson is slated to get the start in Wednesday's series opener. Portland Sea Dogs vs. Hartford Yard Goats (COL), PPD. Rain also wiped out action in Portland, with the Sea Dogs scheduling a makeup doubleheader against Hartford on May 16. The Sox used a six-run fifth inning to pounce on the Hillcats, as Salem saw 11 men come to the plate in that frame. Roniel Raudes did just enough to earn his first win of the season, giving up two earned runs on four hits in five innings of work. He struck out five and walked three. After striking out nine times against Lynchburg's starter, Salem went to work on their bullpen. Josh Ockimey drove in his 19th and 20th runs of the season. Austin Rei, who went 2 for 3 with a 2B and a run scored, Kyri Washington, and Chad De La Guerra all added RBI singles to round out the Salem scoring. Michael Chavis was held hitless. Josh Tobias stole a pair of bases. Logan Boyd improved to 3-0 on the season with his third consecutive solid start. Boyd lasted six innings, giving up just one run on a pair of hits. He walked just one and struck out five. Boyd retired the last seven men he faced. Santiago Espinal went 2 for 4 with a double, a run scored and an RBI out of the leadoff spot. Tyler Hill went 2 for 5, collecting his first triple of the year and an RBI. Player of the Night: On a quiet night, the quality start from Logan Boyd gets the nod. After a shaky first outing, Boyd has given up just two runs in his last 17 innings pitched. The 23-year-old lefty hurled 139 1/3 innings in 27 starts last season for Greenville, posting a mediocre 4.78 ERA. He did strike out 112 and walked just 31, but he gave up 169 hits on the year. A 19th-round draft pick in 2015, Boyd is showing some signs he might be ready for a promotion to Salem if he keeps up this pace.